The Disability Supports Service in University College Cork (UCC) recognises that students with disabilities should have the same access to the full range of student services that are provided by the University. This includes access to both the social and academic life within UCC and the services range from social or sporting activity, catering and accommodation and access to student’s services. The DSS also recognises that accessibility is more than supporting students with disabilities and all users of the campus need to be considered. 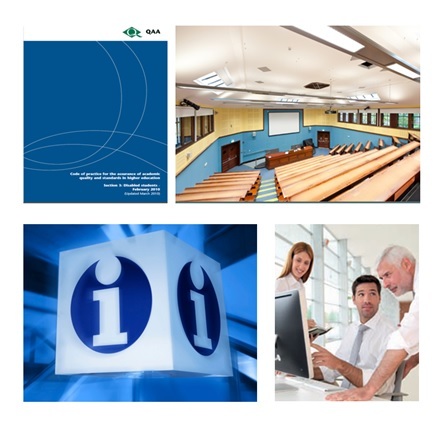 Types of accessible information within the University include the provision of accessible lecture notes; Having accessible websites designed to international standards; Managing the content on the website; Ensuring all conferences and events are accessible; Ensuring accessibility is embedded in the Curriculum Development process; Creating an awareness about accessibility to incorporating accessibility into the promotion of the University. In 2012, O’Herlihy Access Consultancy was engaged by the DSS in UCC to assist in the development of a strategic Accessible Information Policy and Plan for the University. Provided a number of briefing sessions with staff from across the University on the importance of accessible information; what are the key areas that need to be addressed by a University to make their information accessible; national and international best practice and the benefits of providing accessible information. Identified that in order for UCC to take a holistic approach to accessibility a number of key departments need to be actively involved in implemented accessibility. Carried out a detailed accessibility review in consultation with the relevant departments to assess compliance with national legislation and international best practice in relation to accessible information provision. Areas that were reviewed included Access to Students Services; Teaching and Learning; Curriculum Development; Events; Admissions and Exams to name a few. Assisted UCC in the development of a detailed action/implementation plan in line with the requirements of national legislation and international best practice. This project was carried out between 2012 and 2013.